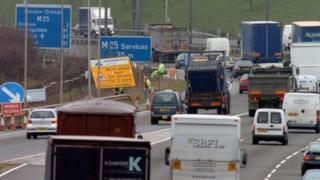 Speed limits for motorway roadworks could be raised in England under plans aimed at reducing congestion. Currently the normal speed for such stretches of road is 50mph (80km/h). But trials carried out by Highways England found drivers' heart rates were lower when they drove at 55mph (88km/h) and 60mph (96km/h) through roadworks. The government-owned company said the new limits could come into effect in some areas this year, but unions warn it would put motorway workers at risk. Highways England recruited 36 participants for two trials and provided them with dash cams, watches with heart rate monitors, and GPS trackers to monitor their reactions to driving through the quicker speed limits. The tests took place at 60mph on the M5 between junction 4A (Bromsgrove) to junction 6 (Worcester), and at 55mph on the M3 in Surrey between junction 3 and 4A. The study found 60% of those who drove in the 60mph trial zone had a decreased average heart rate, while it was lower for only 56% of those on the 55mph journey. But trade union Unite, which represents road workers throughout the UK, said the proposed speed increases ignored the safety of those maintaining motorways, who "work in already very dangerous conditions". A spokesman said: "Sadly, in recent years there have been several deaths of motorway workers and these changes will make their work even more dangerous. "Already motorists frequently drive into coned-off areas. At increased speeds, it will make such potentially lethal accidents even more common." The study suggested that motorists felt more relaxed travelling at higher speeds, partly because they had a greater ability to accelerate past heavy goods vehicles. Edmund King, president of the AA, said that most trucks have a speed limiter set at 56mph: "And sometimes they're pretty reluctant to slow down so you get a lot of tail-gating of trucks driving very close to cars and then the cars are inclined to speed up." While Mr King said increasing the speed limit could help reduce congestion, he said it had to be targeted at the longest stretches of road works where there were no workers. He said: "When work is going on and it's in close proximity to the carriageways we should stick at lower speeds and sometimes it needs to be lower than 50mph, depending on the layout." Jim O'Sullivan, chief executive of Highways England, told The Times that the 60mph limit was "something that we want to introduce to as many roadworks as possible". But Mr O'Sullivan said that lower speeds were likely to be maintained in areas with narrow lanes, contraflows or where workers are close to the road, due to safety reasons. Highways England has been testing different speed limits since September 2016 as part of a wider initiative to assess the benefits associated with increasing speed limits through roadworks. Those trials on a section of the M1 near Rotherham and on the A1 between Leeming to Barton examined the safety implications of the scheme as well as the journey-time benefits for drivers travelling through roadworks.